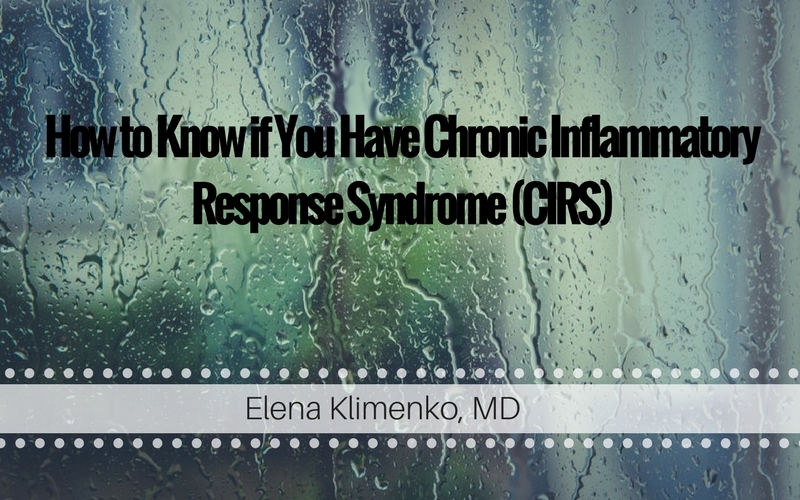 How to know if you have a Chronic Inflammatory Response Syndrome? Home - How to Know if You Have Chronic Inflammatory Response Syndrome? Illnesses caused by biotoxins are on the rise. Since I’ve begun testing my patients for Chronic Inflammatory Response Syndrome (CIRS) markers in my practice, I’m surprised at just how prevalent this condition is turning out to be. Up to 25 percent of the population is thought to have the gene HLA, which makes them more susceptible to biotoxins. Though anyone can be impacted by biotoxins, these people are much more sensitive and therefore more likely to have symptoms strong enough to send them to the doctor. Part of this apparent uptick in biotoxin illness is also due to the improvement in diagnostics. We are realizing the body’s reaction to mold, Lyme, and other biotoxins are unique in each person, which is partly why strategies for identifying and correcting these problems have remained largely underdeveloped until recently. If you’ve been struggling with chronic health issues, you may want to consider getting yourself checked for Chronic Inflammatory Response Syndrome. So what is CIRS? Chronic Inflammatory Response Syndrome or CIRS is a condition with a wide range of symptoms which are triggered by a biotoxin – usually mold. The term CIRS was coined by Dr. Ritchie Shoemaker to describe when a body’s immune system is out of whack. In some people this could mean the immune system is simply weakened, while in others it’s running rampant. You can also get CIRS from common chronic sinus infections with MARCONS and tick borne illnesses like Lyme disease ticks, fish that’s been contaminated with ciguatera, and infections from a brown recluse spider bite. Essentially, CIRS is a dysfunctional reaction of the body’s immune system in response to a biotoxin. In my practice, I’ve seen the symptoms range from manageable to debilitating. The different markers that we can test for, and the differences in how symptoms present, make CIRS a difficult condition to diagnose. Though diagnostics are improving, there still needs to be a cluster of symptoms and an improvement in treatment response for a CIRS diagnosis to be made. Unfortunately, it’s not unusual for a person with CIRS to go years, even decades, without a proper diagnosis. However, if we can pool our knowledge and spread the word about the differences in this condition, I believe we can make a major difference in awareness and treatment of CIRS. This is part of the reason I’ve begun testing most of my patients for biotoxins and CIRS markers. There are numerous symptoms of CIRS, different biomarkers, and the toxins also differ. This complicates the diagnostic process and is part of the reason CIRS has gone largely ignored by conventional medicine. But just because an illness is complex and not fully understood, it doesn’t mean we should shy away from helping people heal – we just need to adjust our approach accordingly. Testing and treatment often have to happen side by side when tackling CIRS. Sometimes the response to different treatments actually help in achieving a complete diagnosis. Symptoms, biomarkers, and testing must be used to correctly diagnose CIRS. If you have some of the symptoms associated with CIRS, you should make an appointment with a doctor who is experienced in dealing with this condition. If you’re in need of a New York certified functional medicine doctor, you can request a consultation here. Some of the biomarkers for the different underlying causes of CIRS overlap, some are different. These are some of the biomarkers seen in mold patients which have been the most common forms of CIRS I’ve found in my practice. C4a – An activation protein that can cause inflammation, free radical production, and damage to tissues if too high. TGF–beta1 – A cytokine in the immune system that has both anti– and proinflammatory effects. MMP–9 – An enzyme that helps with tissue repair and is a significant marker of CIRS. ACTH / Cortisol – A hormone that can be elevated and lead to weight gain in CIRS patients. VEGF – A protein that causes blood vessel formation. MSH – A hormone that is anti-inflammatory and typically low in CIRS patients. ADH – This hormone regulates the amount of water your body removes and is associated with dehydration, frequent urination, and excessive thirst. Visual contrast ability – You can take the VCS test, which is simple and can be done at home. The Visual Contrast Sensitivity (VCS) test checks for neuroinflammation, which is often caused by mold exposure. The VCS test checks your ability to see differences in colors, a common symptom of CIRS. It’s also only $10 and can be done at home, so it’s a good place to start. There is a Mold CIRS Panel laboratory markers that you can test in the conventional laboratory. This panel tests for MMP9, TGF-beta1, MSH, ADH, and osmolality. If you believe your symptoms might be caused by chronic inflammatory response syndrome, it’s so important that you make an appointment with a doctor familiar with this condition. I can’t tell you the number of times I‘ve seen patients who have gone from doctor to doctor trying to find the cause of their symptoms. When CIRS is the suspected culprit of your symptoms, there are a number of things that can be done right away to ease your struggles. Intervention and remedies like eating specialized diets, taking supplements that support natural detoxification, sauna therapy, and mold remediation can help those with CIRS. If you are in need of a New York functional medicine doctor who is experienced in CIRS, you can request a consultation here. Don’t wait until this condition becomes worse, you can begin the path to relief today.